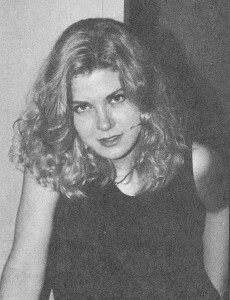 "I Was the Worst Child"
Jennifer Lien is one girl who thrives when living on the edge. But sometimes, we all need a little help ... even Jennifer. We saw you on TV at the Emmy awards. You were a trophy girl. Did you enjoy it? Jennifer: Are you ready for this? I had just moved into a new apartment, and for a week I couldn't sleep. I had also been trying to get situated with an agent out here and I had been going out with this great guy and I wanted to spend more time with him before he went back to California. Then the Emmys came up and I had worked the day before, and the day of the Emmys (Tuesday). The Friday before 3:AM, a friend called me that a friend of ours had died. I flew out to Missouri for the weekend till Monday morning. I didn't sleep any of those days, it was hell. After the funeral, they partied all weekend. I got off the plane Monday and got the scripts, got what I was supposed to wear, and went to rehearsal. I went to the gym, I studied, I was wired from being awake so long that I couldn't sleep. Tuesday I worked, and that night was the Emmys, and I was having real trouble absorbing the fact that my friend had killed herself. I was exhausted and had been drinking coffee all day, so I was like: "Oh god, I can't go on!" I was so tired, I couldn't keep up the energy and I was pacing back and forth and making everyone else crazy, saying, what if I trip or fall or forget? Well, I did go on, and I didn't trip or fall or forget. Whew! That's some story! How did you get into all this, I mean the acting business? Jennifer: When I was a little kid in Chicago, I always used to pretend I was somebody else. I wrote little plays, I was a tomboy, I hung out with the guys a lot. I never had much interest in hanging out with girls. I was always writing plays or watching movies or reading books, and when I was in seventh grade in junior high, I joined the drama club and found that I could fit right in, I could relax, I could do anything I wanted. I began to think I could make a difference, I could make people happy. I felt like I made the world just a little better for a while. Then, on the advice of an eighth grade teacher, I went to acting class, and then got an agent. I did industrial films and some theatre. Soon, casting directors started hiring me and then I got an interview with the people from AW. They liked me, asked me to come to New York, so here I am! Jennifer: I have a brother and a sister. My sister is married and I have a little niece and one on the way. My mom and I are best friends. She knows everything about me, and I wouldn't have it any other way. I don't think I need to be this sweet naive, innocent little daughter. My parents just raised me to be honest. They're very hip people, they know exactly what's going on. I was the worst child! They finally decided, "This won't work, we've got to give her the direction she needs." Whenever they told me no, I was going to do it the other way. When I got the AW job, mom moved to New York with me and I'm glad she did. She made me realize that I didn't know as much as I thought I did. She helped me out a lot. New York is a big city and it can be mean and I'm glad she was here to help me through it.